We have a team of around 100, carefully-selected independent professionals who are all experts in their field. They specialise in one or more areas. They undertake regular training, and many of them have additional qualifications or have worked for a company for several years. Our translators are familiar with your industry-specific terminology and always work into their mother tongue of which they have a perfect command. Your communications are in good hands! 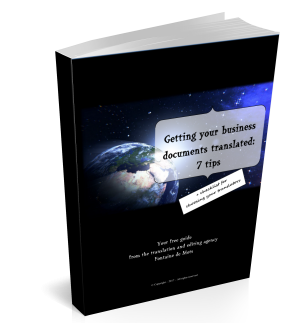 We don’t use Google Translate or other automatic translation systems for your business translations. Such systems make all sorts of errors, some of which could have serious consequences for your business and reputation. We always entrust your texts to two flesh-and-blood professionals: a translator and an editor. Once the translation is completed, it is carefully edited by a second translator: he or she compares the translation with the original text, sentence by sentence, then improves the style, checks the terminology and corrects any grammatical or spelling errors. In this way, you end up with quality texts that are a credit to your company’s reputation. Because don’t forget: your clients tend to subconsciously judge the quality of your products/services on the quality of your copy. To show your company in the best possible light, make sure your copy is 100% error-free. We are not the cheapest and we are not the most expensive either. We provide a quality service at a fair price. If there are several blocks of repeated text in your documents, the good news is that we offer a reduction for multiple repetitions. What’s more, if it’s your first order, you will also receive a discount – a brilliant welcome offer specially reserved for new clients! We meet the agreed deadlines and can give a really fast turnaround when necessary. For example, we regularly translate press articles for Le Vif and Data News. These jobs are invariably urgent, and we handle them with a smile and plenty of flexibility. See the testimonial from Data News. We treat your documents with the utmost confidentiality. We are used to handling sensitive information, including for multinationals, large organisations and listed companies. It takes time and skill to handle translation projects. You need to know where to find competent translators who are familiar with the terminology. You need to be able to manage a complex project in one or more languages and act as the point of contact for the different translators involved. Don’t waste your time: focus on your core business instead. Simply send us an email and we will manage your project from start to finish. We will make suggestions which could help you save time and money and point out any errors or inconsistencies we find in your documents, at no extra cost. In short, we will handle your texts as if they were our own and work with you to find the best way to communicate with your audience. Our clients appreciate this little extra and our advice. See the testimonials from Agoria and SoftN. Fontaine de Mots can count on several specialists for every field. If one is on holiday or ill, there will be another one available. We can even provide you with a replacement if your own translator or editor is absent. See the testimonial from Data News, part of the Roularta press group. Fontaine de Mots offers a personalised service. Our best clients even regularly receive surprise extras. Respected and appreciated for their true worth, our partners give you their best: they take the time to provide work of an irreproachable quality. We take steps to guarantee consistency between your projects: we use the same terminology and try to always use the same experts. We provide tips and ideas for growing your business. Check our website, Facebook, Twitter and LinkedIn profiles regularly for the latest updates!